Prepared in 40 minutes or less plus 90 minutes to bake. In a large skillet, simmer sausage in 1-inch of water for 15 – 20 minutes. Drain then brown inside skillet. Drain cooked sausage then cut into 1-inch pieces and set aside. In the same skillet, simmer the bacon in 1-inch of water for 10 minutes then drain. Add bacon, onion, garlic and green pepper into skillet and brown together, constantly stirring. Add the tomatoes, nutmeg, thyme, salt and chili pepper. Cook covered 10 minutes. Add browned sausage. Preheat oven to 375°F. Pour canned chick-peas in a Dutch oven. 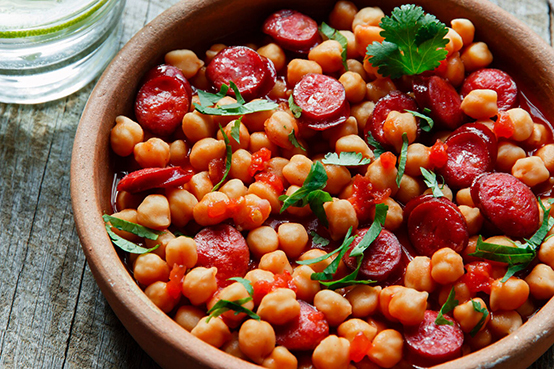 Spoon the tomato, bacon and sausage sauce over chickpeas. Moisten with chicken stock. Season with salt and fresh pepper then cook for 90 minutes, stirring time to time. Serve in large soup bowls or cappuccino cups. Serves 4.